Rashmi Singh is an Associate Professor of the Post-Graduate Program in International Relations at PUC Minas. She holds a bachelor's degree in History from Delhi University (Delhi, India), a master's degree in History from Jawaharlal Nehru University (New Delhi, India) and a doctorate in International Relations from the London School of Economics and Political Science (UK). She has regional expertise in the Middle East and South Asia. She is fluent in English, Hindi and Urdu, speaks intermediate level Portuguese and has a working knowledge of Arabic. 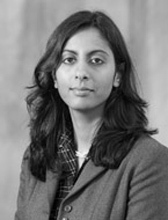 Prior to joining PUC Minas in early 2016, Dr. Singh was a Lecturer in Terrorism Studies at the Handa Center for the Study of Terrorism and Political Violence (CSTPV, The University of St. Andrews, Scotland) where she was based from 2008- 2016. She was a member of the World Economic Forum's Global Agenda Council on Terrorism (2013-2014). Dr. Singh also served as lead investigator on the START-funded project, ‘In the Eyes of the Beholder’ which developed metrics of success and failure in the Global War on Terror and the Global Jihad. She also received the visiting professor's scholarship from the Brazilian funding body CAPES in 2013/14 during which period she was a Visiting Professor with the International Relations Department of PUC Minas. Dr. Singh is a member of the editorial board of the International Journal of Conflict and Violence (IJCV).